A longitudinal section of the Arrow mine plan relative to inferred resources. 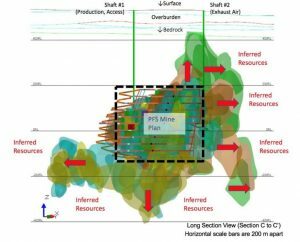 Red arrows indicate inferred resources not presently included in the mine plan. SASKATCHEWAN - Vancouver-based NexGen Energy, Wood Group and Rosco Postle Associates have completed the pre-feasibility study for NexGen's Rook I project in the Athabasca Basin. New numbers include a 64% increase in average annual after tax cash flow and a 43% increase in indicated resources compared to the 2017 preliminary economic assessment. The PFS looks at mining the Arrow uranium deposit that has indicated resources of 2.9 million tonnes grading 4.03% uranium oxide and containing 256.6 million lb. of metal. The inferred resource is 4.8 million tonnes grading 0.86% and containing 91.7 million lb. of uranium oxide. The largest change between the PEA and PFS is that the mine life has been cut to nine years from 15 years, and the head grades are much higher - 3.09% rather than 1.73%. NexGen gives the Rook I project an after tax net present value (8% discount) of $3.7 billion and its internal rate of return as 56.7%. The average annual after tax net cash flow for the life of the mine is $909 million, after initial capital costs of $1.3 billion. Over a nine-year life, the mine will produce 29.0 million lb. of uranium oxide each year. Average annual operating costs will be $5.81 per lb. All the details are available at www.NexGenEnergy.ca.